We have a solid background in documentary production and co-production, with decades of experience and having helped many other companies with their projects. Here you will find information about some of our own documentary productions, from Irish artists to European politics. 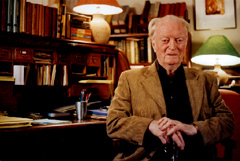 The fascinating life of Ben Kiely, novelist and short story writer, and major figure in 20th century Irish literature. Great friend of Brendan Behan, and enemy of censorship, life long opponent of Partition and outspoken at the Troubles arising from it, journalist and narrator on RTE radio. With the help of his friends and contempory artists Seamus Heaney, John Montague, Tom Kilroy, Val Mulkerns, Colum McCann and Steven McKenna, all of whom appear to tell the story of Ben's life and work, we go on a journey through half a century of unique writing by a unique man. The DVD available from our shop is a powerful educational package including a round table discussion with experts on Ben's work and the influence he had on Irish literature, as well as music and song, and downloadable info files. Documentary on the drafting of the first European constitution following the process of decision making by the decision makers and the consequences for the new soon to be enlarged Europe. Over a period of a year we followed the human and political process of the creation of the first draft of a European Constitution. The forum to enable this process was the 'Convention', the controlling body of the Convention the Preasidium. The stories of the five members of the Preasidium, and the public and behind the scenes dealings of the nations as they joust for the best terms, unfolds, against the visions for a united and integrated Europe that has recently expanded to 25 countries, unique footage and access allowed us to make one of the most intriguing and informative accounts of the forming of the new European Constitution. 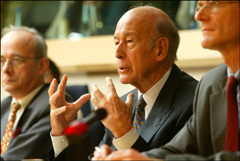 Regarding major actors such as Valery Giscard D’Estang (Ex-President of France), Jean Luc Dehaene (Ex-Prime Minister of Denmark), Giuliano Amato (Ex-Prime Minister of Italy), Ana Palacio (Ex-Foreign Minister of Spain) and John Bruton (Ex-Taioseach of Ireland). Completed and aired on eight television stations in Europe: RTE, YLE, RTBF, ERT3, TV5, IMAGE+, LCP-AN, POLIS, (Ireland, Belgium, France, Greece, Finland). 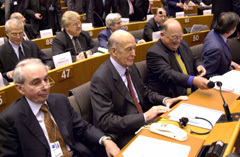 Also screened as a special in the European Parliament, 25th May 2004. Co-produced with Domino Productions Belgium. Directed by Sergio Ghizzardi. Currently in production this film is about the clash of cultures in the Amazon forest where Brazil meets Venezuela, progress meets survival, and the future destroys the past. Scream is a short film about the artist Tony Crosbie. Exploring the life experiences through his paintings of a working class artist it touches on the issues of addiction and abuse and the ability to overcome adversity through art. This is a small part of a much larger project that has been following this artist for the past decade. We are currently working on several documentaries of feature length and a short film on Piet Sluis the painter. THE STORY OF A MAN WHO TRIED TO BRING PEACE AND STOP A WAR BY PLAYING MUSIC ON THE STREETS OF A WAR ZONE. A FILMIC TAPESTRY ABOUT DESPAIR AND MADNESS, HOPE AND HUMANITY. Vedran once lived in Sarajevo. He was there when it was blasted by the Serbs. He was the man that sat with a cello, in the middle of the square where a terrible bomb had killed more than 22 people, men, women, and children waiting in line for bread. At exactly 4pm he played music. For every person that died. Shells and gunfire all around. It’s a miracle he didn't die, let alone live to play in other countries with musicians from around the world. In time other musicians took up the call and played music for peace, compassion, understanding. For civilisation. They also braved death beside Vedran. Five years ago he moved to Northern Ireland, and in 1999, released an album, 'Sarajevo to Belfast' with Colum and Tommy Sands, two Irish Folk musicians. Strange that he should move from one scene of conflict to another. To a place that replicates the insanity of the world he left. But he feels safe here. This will be a journey through pain and despair, the will to live, to say no, to fight back without a gun, and to find a new home. We will discover the ways in which music can effect change and cross borders, how solitary actions can give hope and make huge changes. And we will get an insight into a man that was a hero, and the life he leads now, a decade after he first stepped out into the street to play for peace.